title (string) – dialog title. store_key (string) – a key to restore previously saved login and password. True, if the user entered login and password and pressed “OK” button or if the login and password were saved earlier. If the login and password were saved during a previous call, the dialog window is not displayed, “True” returns, and then you can resolve the login and password by using the following methods: login() and password(). store_key (string) – key for saving login and password. expires (int) – password storage period, days. Setting the argument to -1 means the storage period is unlimited. 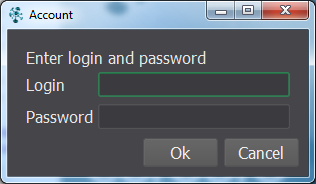 The dialog saves login and password by a text key for the desired period of time. To restore a previously saved password, pass the key used for saving to the dialog constructor. All passwords are stored in encrypted form.